Hi! I’m Rachel, owner of QuirkyBaby. Jane McClintock started QuirkyBaby in 2006 as a place to share her love of babywearing and to help other parents choose and learn to use the best baby slings and baby carriers for their needs. I became the new owner of QuirkyBaby in September of 2012. Like Jane, I firmly believe that there is no “best” baby sling or baby carrier out there — like shoes and jeans, baby slings and baby carriers are not one-size-fits-all. I started babywearing in 2009 with the birth of my daughter. Since then, I’ve become experienced with many different types and brands of carriers. With a degree in Human Development and having been an elementary teacher for the past 10 years, babywearing fits so well with my beliefs and understandings about early childhood development. I’ve been the leader of a local babywearing group for the past 2 years and have received training through the Babywearing Institute, as well. It’s always incredibly rewarding to be able to help moms and dads find the carrier that works best for them! My goal at QuirkyBaby is to offer you the best of the many carriers I have tried, and to help you find the one (or more) that will work for you and your baby. 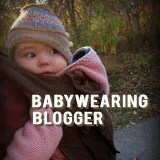 Read reviews of QuirkyBaby at The Babywearer — and if you’re a QuirkyBaby customer, please feel free to leave a review to let others know about your experience.